Stevens Square	The park and neighborhood organization host many social, art, music and cultural activities. Basketball Court is half-court. Well is located at the intersection of East 18th Street and Stevens Avenue. Name: The park was named for Col. John Stevens on January 18, 1908. 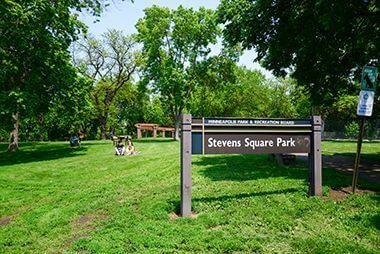 It was also the name of the street on which the park is located, which was named for Stevens, too. Stevens was an early settler in St. Anthony in 1849. He built the first wood frame house on the west bank of the Mississippi River, just above St. Anthony Falls, in what was to become Minneapolis. That house was later acquired by the park board and is now located in Minnehaha Park. Charles Loring first suggested acquiring the Stevens House and placing it in Riverside Park in 1887. 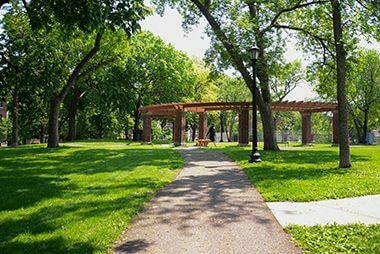 At one time the park board considered placing the house in Loring Park instead, but then returned to the original plan. The house was relocated in 1896 to Minnehaha Park in a most unusual display of civic participation. The house was pulled by an estimated 10,000 school children, tugging on huge ropes in relay fashion. A statue of Stevens has also adorned Minneapolis parks since 1911. It was commissioned by Stevens’ daughter, Katharine Stevens Winston, and donated to the city. The park board accepted the statue, with the approval of the Municipal Art Commission, for placement in Stevens Circle. Stevens Circle was then known as Portland Avenue Triangle at Portland and 6th Avenue South. In the resolution accepting the statue, park commissioner Portius Deming said that it portrayed a man who “rocked the cradle of Minneapolis in its infancy,” and a man who was “loved for his generous character, gentle personality and unblemished life.” The statue was created by sculptors Jacob Fjelde (who also created the statue of Hiawatha and Minnehaha above Minnehaha Falls) and John Gelert. When the Municipal Art Commission approved the statue for placement on public land in late 1910 it did so with the suggestion that “in better keeping with the natural dignity of the figure the hat be removed or else held in the hand” and that the statue be given “a suitable architectural background or setting rather than to stand as an isolated figure.” Neither suggestion was followed. Stevens Triangle was turned over to the city council for traffic purposes in 1935 and the statue of Stevens was relocated to Minnehaha Park. It now stands near the entrance to the Stevens House in the park. Acquisition and Development Stevens Square was purchased December 31, 1907 from R. J. Hill for $41,820 at the request of David P. Jones and others. 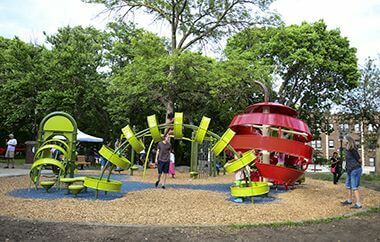 Jones had finished a term as mayor of Minneapolis, and ex-officio member of the park board, earlier that year and would later be elected to the park board. Stevens Square was the smallest of three parks purchased that year, but the most expensive per acre. The other two parks purchased in 1907 were North Commons and Kenwood Park. The petition for the park included an expression of willingness by property owners in the vicinity to be assessed for the cost of the park, and they were assessed. Stevens Square received little attention from the park board until 1910, other than having two park board-sponsored concerts in the square in 1909. The park board denied several requests for improvement to the park in 1910, it said, because of an understanding at the time of acquisition that no expenditures of a considerable amount would be made at the park for some time. The board did, however, direct park superintendent Theodore Wirth to provide a plan for improvement of the square in the 1910 annual report and “to more carefully maintain said Square during the present year than in the past.” In the 1910 report Wirth provided a plan for the park, but noted that the elaborate walks, plantings and floral beds suggested by the park’s location in “a fine residential district” was not possible without “radical changes in topography,” which would do away with a “fine grove of oaks, more or less covering the park.” Instead, Wirth’s plan kept those trees, but placed a drinking fountain and child’s play area at the center of the park, with a tennis court on the north end, and two flower beds. Improvements began in 1911 with the installation of a tennis court (it didn’t get a backstop until 1915) and the ground was sodded with turf taken from the new Dorilus Morrison Park where the Minneapolis Institute of Art was to be built. That wasn’t enough for residents apparently, because in 1915 Wirth reported again that the neighborhood wanted more improvements. He argued again that topography and trees in the park didn’t permit that. A well and drinking fountain were finally installed in 1916. The tennis court must not have been a big hit because in 1919, at the “urgent request” of residents, it was replaced with a softball field. (At that time what became softball was called “indoor baseball” because it required less space than baseball and, therefore, could be played indoors, though it rarely was. The game also became known as “kittenball.”) Wirth noted at the time that the square was extensively used for public meetings and social activities. The neighborhood and the park had changed dramatically by 1923. Wirth noted in his report that year that the neighborhood had become a densely populated apartment district and that the native oaks on the land were almost all gone and the remainder would die too “due to the increasing unnatural conditions under which they are forced to live.” His new plan for improvement of the park included grading it down to one foot above the sidewalk. On the south end of the square he recommended a “field house.” In the center of the park he recommended a softball field and volleyball court, in addition to a children’s playground. 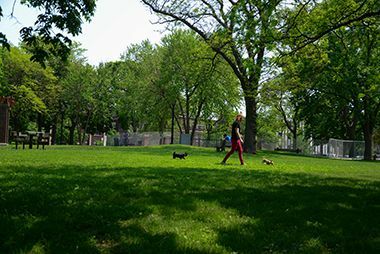 The playing fields, Wirth said, were proposed in part to replace play spaces lost at Washburn Fair Oaks to the southeast, which was being converted to a passive-use approach to the art institute. He planned to use the entire square as a skating rink in winter. In summer, the open porch of the fieldhouse would be a stage for concerts. Wirth repeated his call for a fieldhouse in the square the following year and lamented that the park in its “present condition is far from giving the service which it could render were it improved.” He suggested that the district could afford the “small assessment” that was needed to pay for the improvements. But protests in the community against the improvements—mostly the assessments—apparently dissuaded the park board from pursuing them. In 1927, the park board “filed” Wirth’s plans, meaning they were effectively abandoned. Wirth pitched the idea of improving the square again in 1929, when he presented plans “for the utilization of this almost useless block of land.” He presented two plans, both of which included a recreation shelter. The first would have kept the softball field, by then called “diamond ball,” and added an outdoor gym, gymnastic equipment, and a volleyball court. He added that “none of the above facilities are sufficient for the existing demands.” The second plan, in addition to a shelter would have provided tennis courts that covered most of the square. Wirth said there was no question but that the courts would be very popular. He suggested that the courts could be self-sustaining through a nominal charge for the use of nets. At that time almost no tennis courts in the city were provided with nets; players had to bring their own. Wirth concluded that it was a poor investment to maintain such a valuable piece of land in “almost unserviceable and so unsightly condition.” Still no action was taken by the park board. So, in 1930, Wirth presented a composite plan with fewer tennis courts, no athletic field, but with the addition of a wading pool. This time the park board approved the plans and even hired architect and former park commissioner Harry W. Jones to design the shelter. The plan would cost $57,000 and was to be assessed on neighborhood property. That didn’t fly. In the face of opposition to the assessments, the park board abandoned the plans by unanimous vote late in 1931. Noting that the neighborhood was mostly apartment buildings, the board declared that “it seems inopportune at this time to add to the cost of the operation of these properties by levying special assessments.” The country was in the grip of the Great Depression. Wirth had the last word on the “Stevens Square problem” in his report of 1931. While admitting that the cost of improvements had to be paid by property owners, he said that when the matter came up again the apartment dwellers in the area “should be invited as indirect taxpayers to present their side of the question.” The need for improvements to get “full utilization” of the land, he wrote, was “glaringly evident.” Stevens Square and Peavey Field to the southeast were strong arguments against the property assessment method of buying and developing parks, which had been used as a way to pay for parks since the earliest days of the park board. 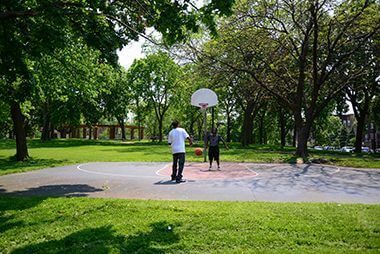 Property owners in older and poorer neighborhoods rarely agreed to the property assessments needed to acquire or improve parks. Property owners in newer sections of the city were more willing to absorb those costs because it usually led to an increase in property values. That didn’t work in older sections of the city. The park board came to that same conclusion in the late 1930’s, but the policy wasn’t scrapped until 1968. Not coincidentally, the next addition to Stevens Square came in 1968, when a “totlot,” a playground for small children, was built. Major improvements were made to the square from 1991 to 1994. 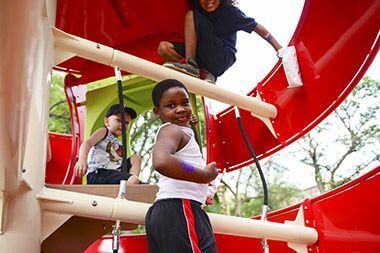 During that time a new playground was installed, a formal seating area with a pergola was built—the area doubled as a performing space for neighborhood events—and a half-court basketball court was added. 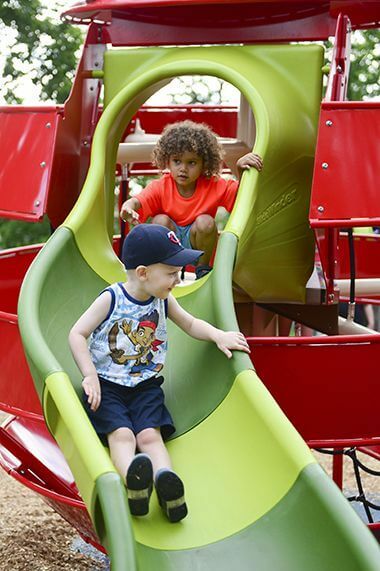 In 2015 a new playground that reflects the importance of art in the community opened. History through 2008 written by David C. Smith, with updates from 2009 to present written by MPRB. 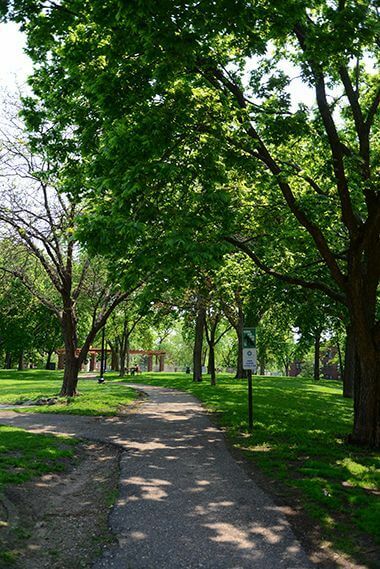 Enjoy a shady stroll along Stevens Square's paved walking trails. Practice your shot, or your one-on-one on these half-courts. The pergola doubles as a performing space for neighborhood events. Enjoy a shady stroll through Stevens Square.